Last weekend, I went on a different kind of trip: a trip to the hospital. I am a typical Sagittarian: optimistic. When it comes to hospitals though, I am terribly pessimistic. Whereas some people see hospitals as beacons of hope, birth and rebirth, I see it as a bringer of death. I don’t know what made me think like this. Probably that one time when we were at the emergency room when I was in highschool. We were visiting an uncle who had a kidney problem. He was always going in an out of the hospital, always hooked up to tubes and equipment. He was particularly weak that time and it was a pretty draining visit. We stayed past the visiting hours, and had to wait at the emergency room for our ride. While waiting, I saw this guy in a wheelchair with a bullet through his calf. It has already stopped bleeding, but his leg was still streaked with blood and only first aid was administered. I don’t know what he was waiting for (maybe a room or a relative to pay for his room deposit), but he was already there when we came down, and he was still there when we left. I don’t know why that affected me so, but I developed this aversion to hospitals. This year actually started with a lot of promise — I was ecstatic during New Year’s and very optimistic for the year ahead. January 2 rolled in and I woke up with a cold, then a toothache, and finally came down with a flu. Maybe that was an omen? Haha. 2006 was probably my unhealthiest year, but it was also a year of positive changes. I set a goal for myself and I was able to meet 3 of my 4 targeted trips for the year. This little trip to the hospital costs as much as a domestic trip would cost, and as a consolation, I’m just telling myself it’s a trip. Of course, this meant no more self-financed trips for me this year. It’s just as well because this hospital trip made me realize what I should be prioritizing. I have gotten pretty reckless with my credit cards and my new hobby (collecting Pinky St dolls), that I’ve neglected to save money and have a medical check-up, which I’ve been promising myself for years. Having pneumonia meant being careful, and I’m not risking any more diseases in the following years. I’ve looked at a couple of visa applications and they’re careful to include a question regarding serious health conditions in their questionnaires. Gah, this is going on my permanent record. 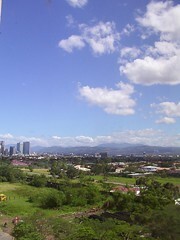 I stayed for 4 days at the wonderful Medical City in Pasig City. Pictured above was the view out of my 5th floor hospital room. Man, I didn’t realize you were there for 4 days! Even pregnant women don’t stay that long in hospitals! At least you had cable & all your friends kept you company. You didn’t bring a pinky or two w/ ya?!? After reading your entry & how much it costs to stay at the hospital, I have a question: what happens to a person who’s on the verge of death & they don’t have any money to pay? Or no relatives? What about medical insurance? Do they just let them die w/out trying to save them? There was a joke that in Manila, you’d die first before they’d admit you to the hospital with all that red tape. Not sure if that’s true. But I do think they’d administer emergency aid if you arrived all bloody and chopped up. Hi Nina. I have found your blog from BnA (mwah hah hah). Kawawa naman, I didn’t know you had pneumonia, girl! Brutal! But I can’t imagine that would prevent you from getting a visa anywhere, don’t worry. Two of my sisters don’t have health insurance & I worry about them. I don’t know what happens when one doesn’t have it, but it’s terrible to consider. You’ve completely revamped your travel blog! I guess I haven’t checked it in a while. I’m sorry to hear about your hospitalization… but highly amused that you’re counting it as a “trip” for this year! I totally understand about using the credit cards too much. And yes, Pinky:st figures can easily become a significant part of that credit card balance! I need to cool it for a while with the cards myself. I’m really happy you’re feeling better. I’m looking forward to photos and commentary from your next trip… which had better not include hospitals! Puuikibeach: Hahaha, yeah. It’s the only way I can accept the cost of my hospital bills.